Disney World was my daughter’s top choice for our family winter break holiday. It was also her choice to leave world-famous theme parks for Four Seasons Resort Orlando at Walt Disney World Resort each day after lunch. 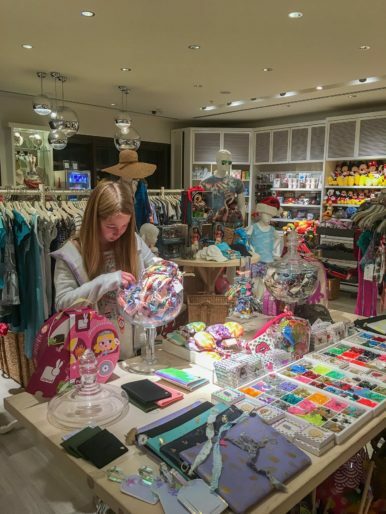 Yes, this luxury resort is one that kids eagerly return to and are not so keen to check-out of. When designing this property, Four Seasons clearly thought through how to make what is usually a high-energy vacation easier and more luxurious for guests. This includes amenities like a grab-and-go cafe, a truly magnificent spa with a princess and prince dress up service for kids, and one of the most epic pool areas I’ve ever seen. There is simply a lot for families to do on-property. It will be the only resort we’ll book for a repeat Walt Disney World Resort vacation. And, they now also participate in Extra Magic Hour. 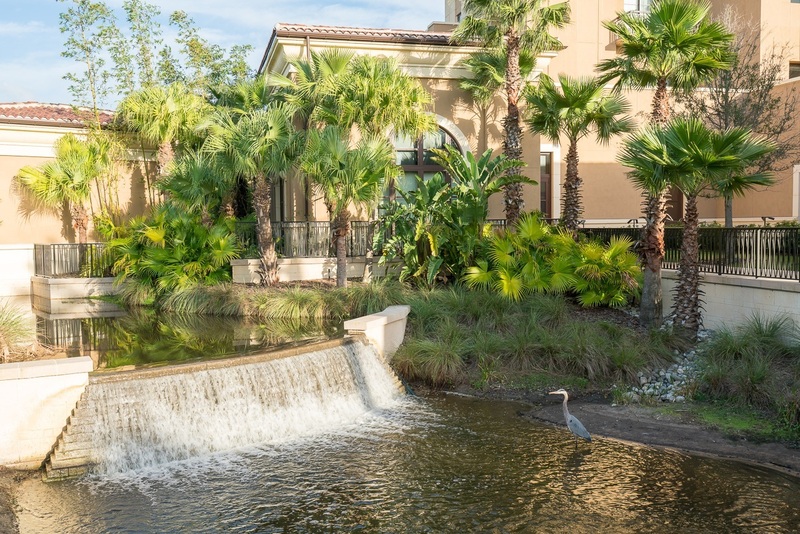 Four Seasons Resort Orlando at Walt Disney World Resort is located inside the private Golden Oaks community which was designed by Walt Disney Imagineers. 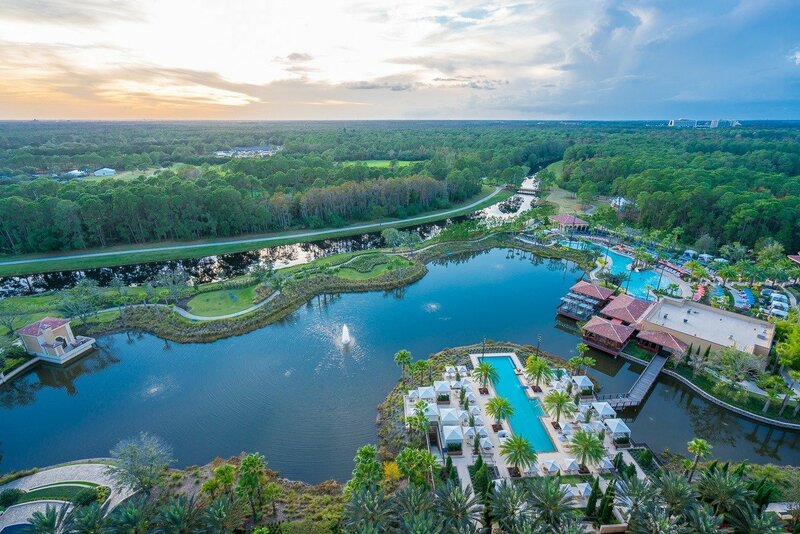 It’s surrounded by natural beauty, including an Everglades sanctuary, and feels like a tropical paradise. It took us about 45 minutes from Orlando International Airport (MCO) by private car. Deer were the first to greet us upon driving through Golden Oak’s gates for the first time as if right on cue. 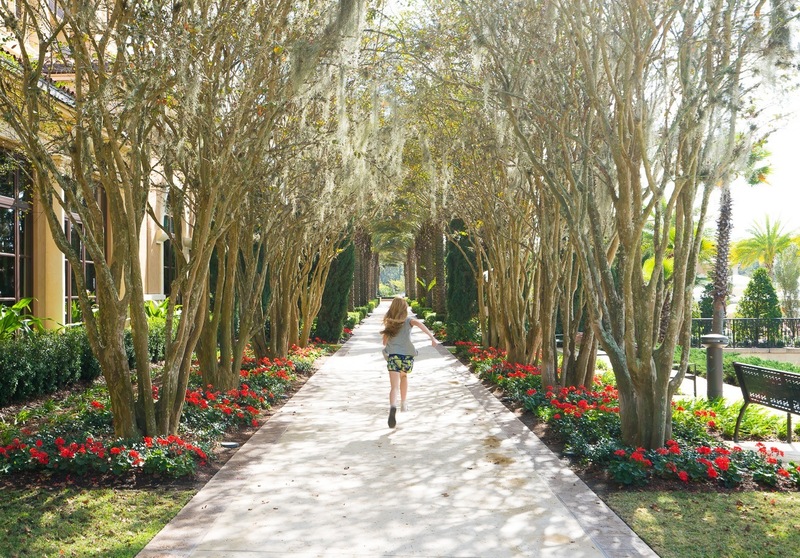 Wildlife roams freely here and the resort’s golf course is even Audubon-certified. I regret not being able to fight jet lag enough to wake up early for a sunrise walk as I suspect birds, deer and more might be out and about. The Magic Kingdom is 3 miles away. Disney Springs took about 10 minutes to reach and Disney’s Hollywood Studios took us less than 15 minutes to reach. 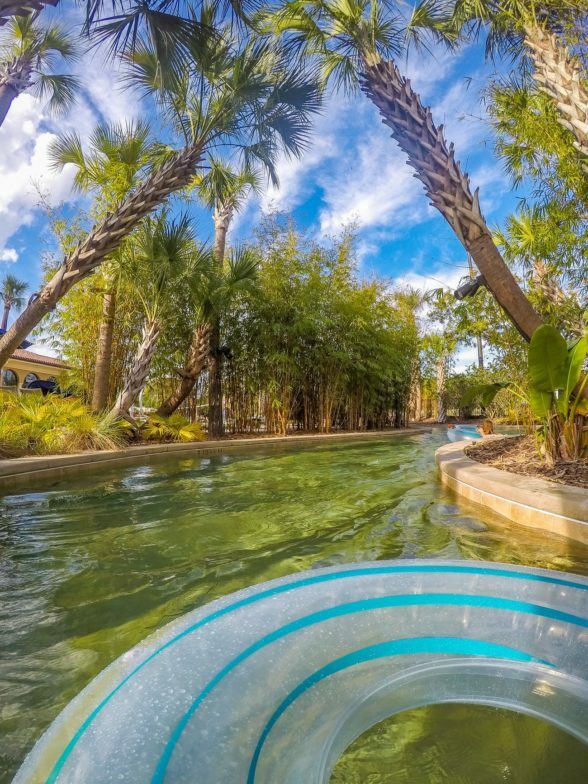 Attractions are easy to get to via Uber, taxi or the Resort’s complimentary theme park shuttle. 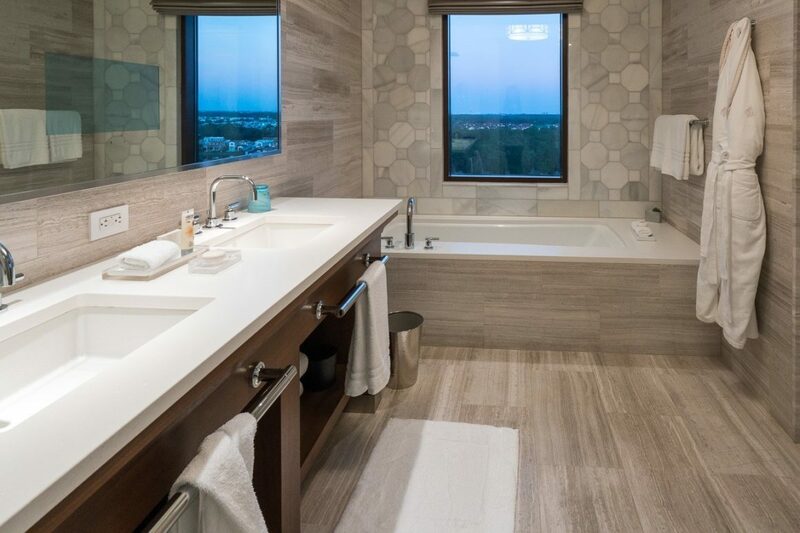 We checked into a gorgeous Golden Oak View Suite just before sundown. It is exactly the amount of space that our family of three needs since we all have different sleep schedules. The living room closed off completely to the bedroom and connecting suites can be added to the suite to make it two or even three bedrooms. Housekeeping transformed the living room sofa into a bed at turndown service. Morning coffee on our balcony proved divine and did I ever love the light fixtures and tiles in the bathrooms (yes, there are two). Some rooms have views of the evening fireworks, which we also saw from the rooftop patio at the onsite Capa restaurant. You may also organize special In-Room Celebrations that could be themed around a special occasion or favorite character. 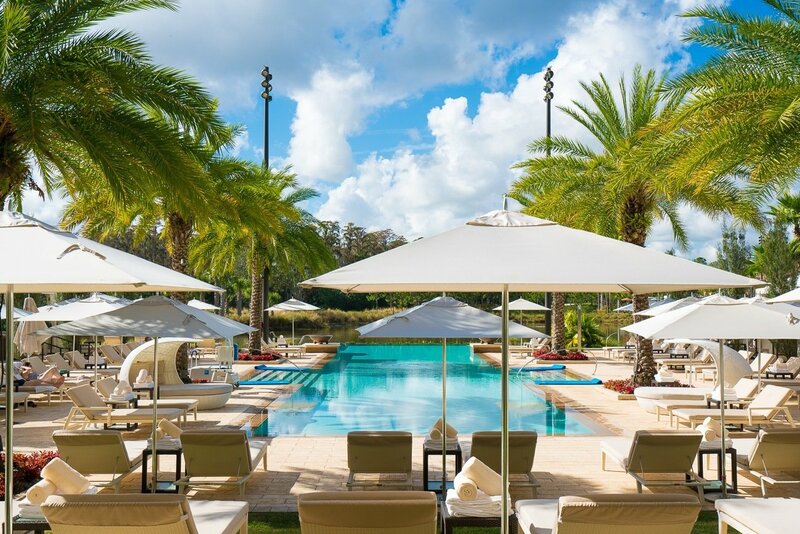 Four Seasons Resort Orlando at Walt Disney World Resort’s amazing pool areas seamlessly mesh the needs of adults who would prefer a little silence as well as kids their parents. 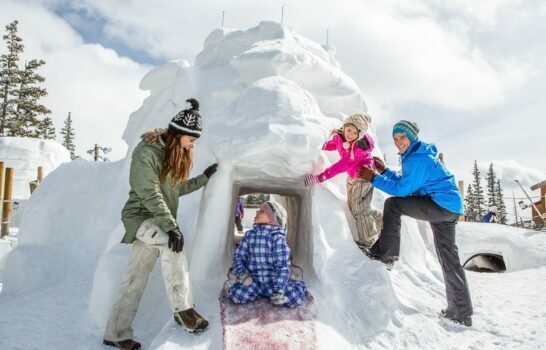 And, with supervised Kids For All Seasons activities, even with kids in tow, parents can seek respite at the Resort. The pool area is called Explorer Island indeed because there is so much to see and do. Our favorite outpost was in the secluded day beds and loungers under the palm trees near the lazy river. Despite this being a family area, it was quiet and with excellent poolside drinks and food. 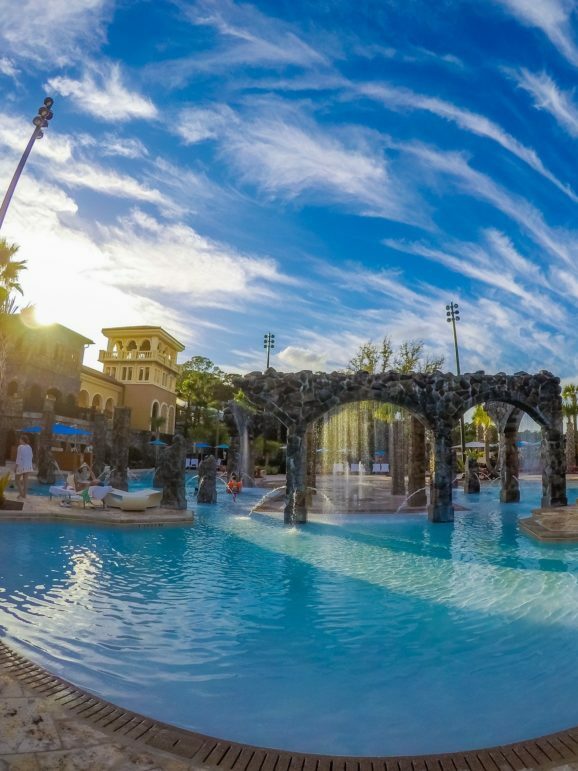 We stepped in and out of the lazy river at leisure. Contrary to other lazy rivers I’ve enjoyed, this one was never hectic. 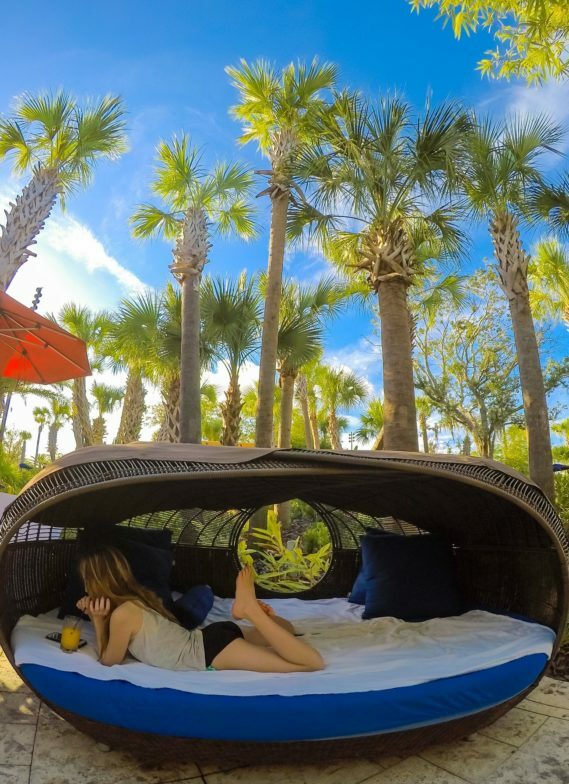 How cool is this daybed? 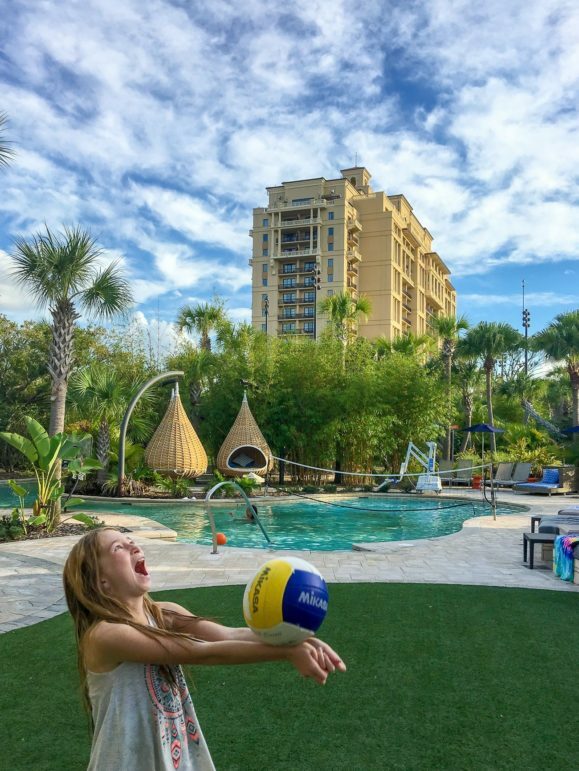 Steps from our lazy river base, we shot hoops in a sports-themed pool area and even played a little volleyball. The Hideout, a supervised indoor area where kids can simply hang out with friends is here, too. A water play heaven called Splash Zone kept younger kids entertained in shallow water. Our family would have loved this area when our daughter was younger. And, this is the only Four Seasons I’ve ever been to with two big water slides. 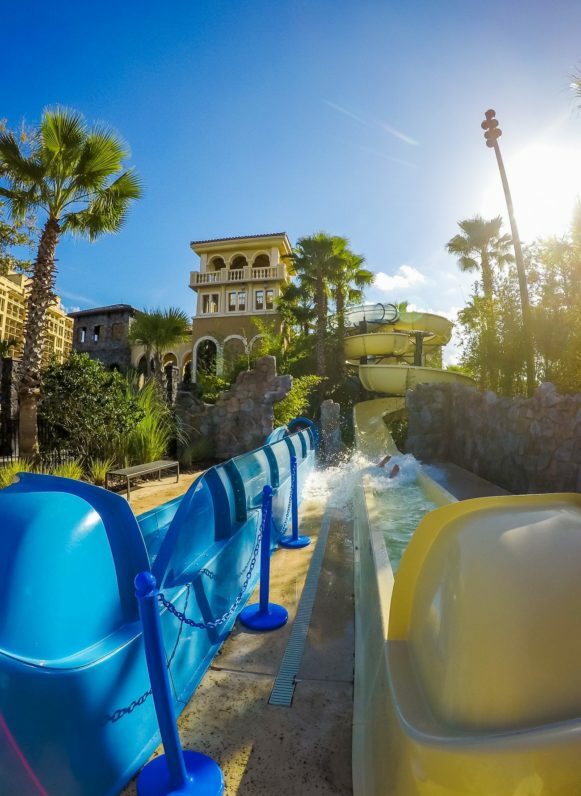 Water slides! I can tell you that they open early. On check-out day, my husband and daughter skipped breakfast to wedge in extra pool time and water slide rides. The enormous Family Pool overlooks the lake, plays festive music, is the site of occasional dive-in movies and is just overall pretty fantastic. Adults have their own quieter sanctuary in this stunning spot overlooking the lake. Have you noticed how gorgeous and comfortable the patio furniture is in every single one of these spaces? In the middle of Explorer Island is a game area enabling guests to bounce between pools and games with ease. We’d even head up here after dinner for a family game of pool, foos ball, chess or bean bag toss. My daughter loved some of these games so much that I bought the same brands for our yard. A full-sized outdoor basketball court, volleyball court, and tennis courts are nearby, too. 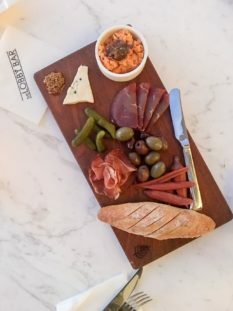 One of the main reasons why we stay at Four Seasons Hotels and Resorts around the globe is because we spend a lot of time eating on property. The food is always excellent. From in-room dining breakfast to Capa, the rooftop Spanish Steakhouse, we managed to do a good job of eating our way through the resort. It’s a nice distribution of options. 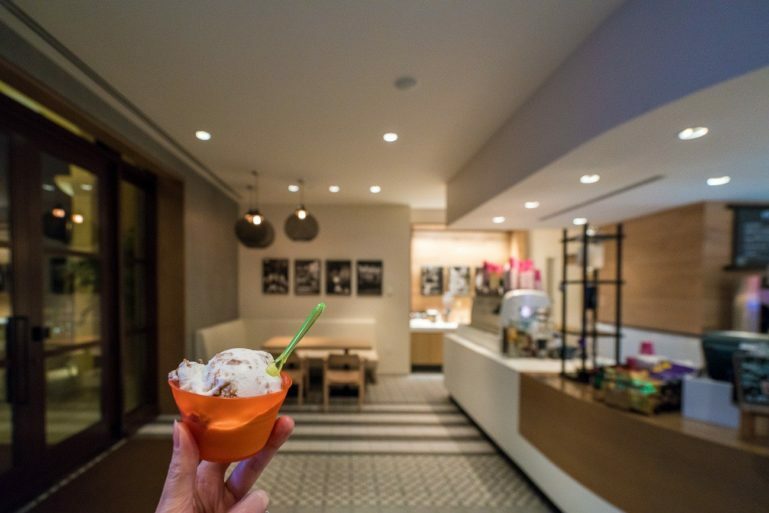 The grab-and-go menu of food and drinks at Lickety Split, including pretty epic housemade gelato, is ideal for snacking and quick meals and I think a must when on an activity-packed vacation. 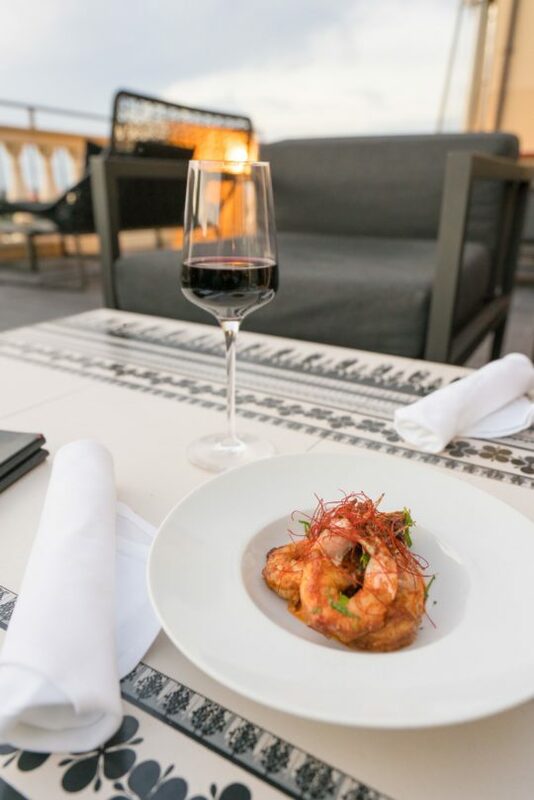 We unwound one evening on the Lobby Lounge patio, too, where options range from sushi to a ridiculously delicious French dip. 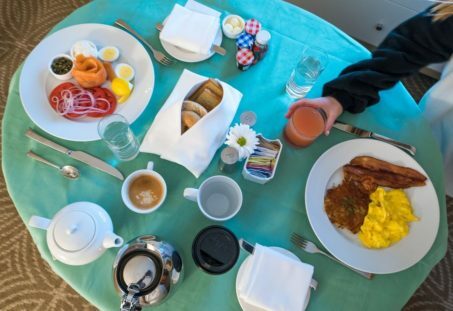 In-room dining breakfast before theme park fun. 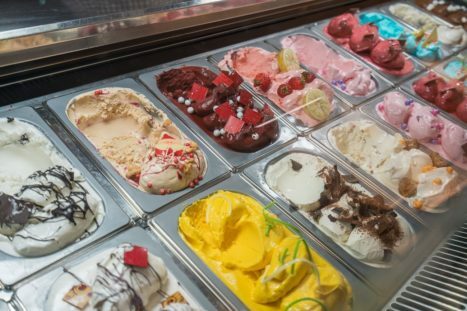 Do not skip the gelato at Lickety Split! 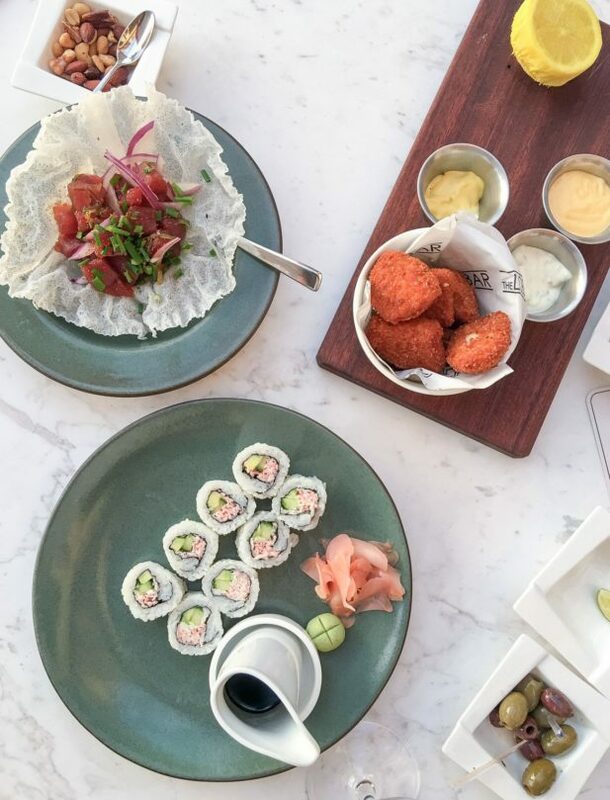 Sushi, poke and grouper bites at The Lobby Bar. Capa has happy hour tapas and drinks. The carrot cake gelato is amazing. Kids love breakfast with Goofy! 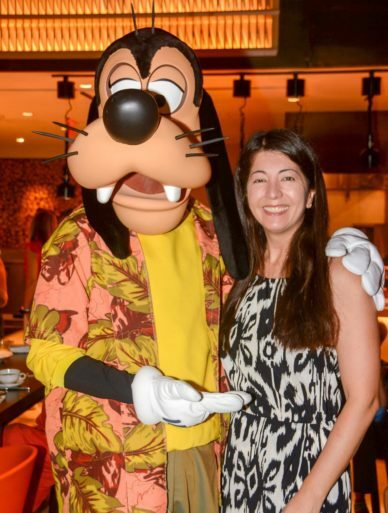 Ravello Restaurant hosts a fun Good Morning Breakfast with Goofy and His Pals character breakfast twice per week (currently Thursdays and Saturdays). It is buffet style with plenty of character interaction for kids. A photographer is present to take photos which you may download for free at Disney PhotoPass. Having been to many character dining experiences, this is one of the best. 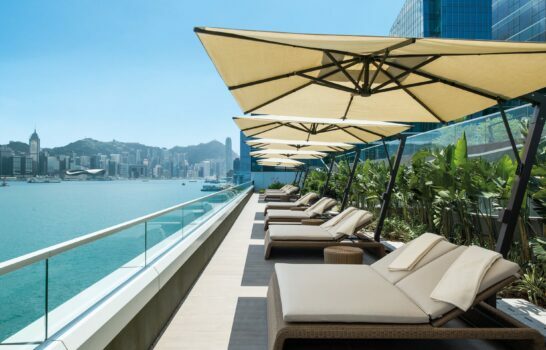 Photo is courtesy of Four Seasons Hotels and Resorts. I did not have time for a spa treatment on this trip but regretted that instantly after touring the gorgeous facility. Between the jet lag and full mornings of walking, my body could have used a little rejuvenation in between park visits. 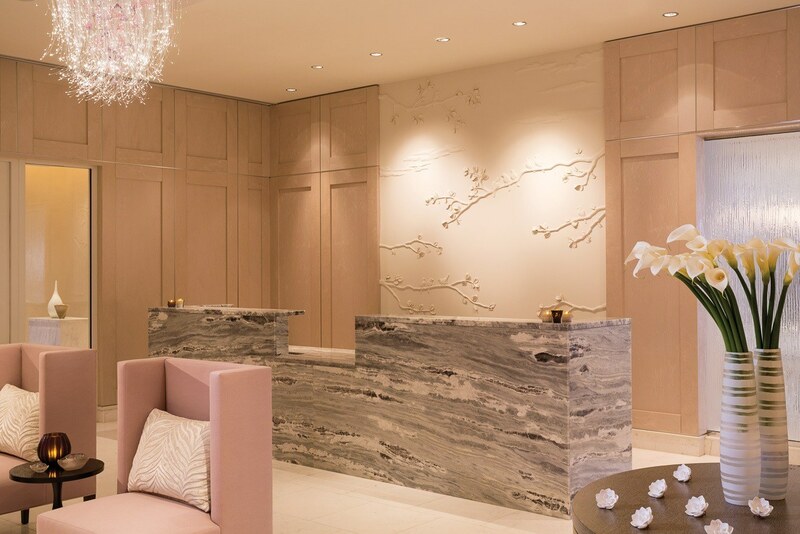 This is a very large spa at 13,000 square feet, and it has a full menu of spa services including hair, make-up, and nails. 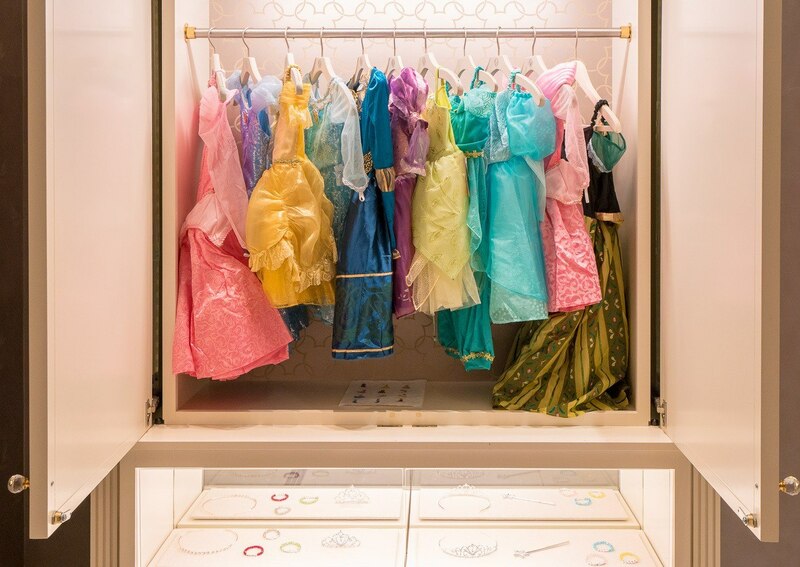 The Magical Makeover transforms kids into princesses or princes. Imagine the look on their faces after this closet opens. 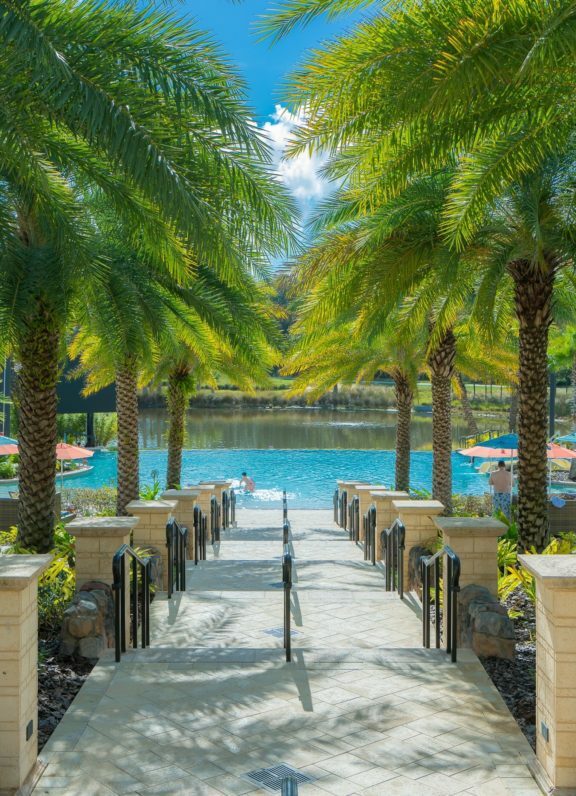 Disney Cast Members are onsite at Four Seasons Resort Orlando at Walt Disney World Resort to help guests plan the perfect Disney itinerary. We bought our Disney tickets online in advance of our stay but picked them up here. They can make dining reservations and also have Magic Bands. 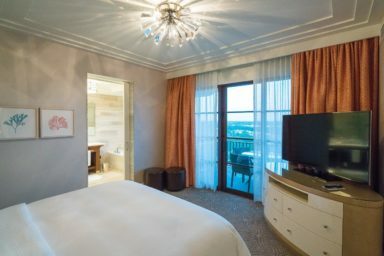 Four Seasons Resort Orlando at Walt Disney World now participates in Extra Magic Hour, making it truly the perfect Disney resort. To begin the process of using this benefit on a 2018 Disney vacation, guests age 3 and older will need a valid, official Extra Magic Hours voucher from Four Seasons Resort Orlando, and a valid Walt Disney World theme park ticket, to use the Extra Magic Hours benefit. 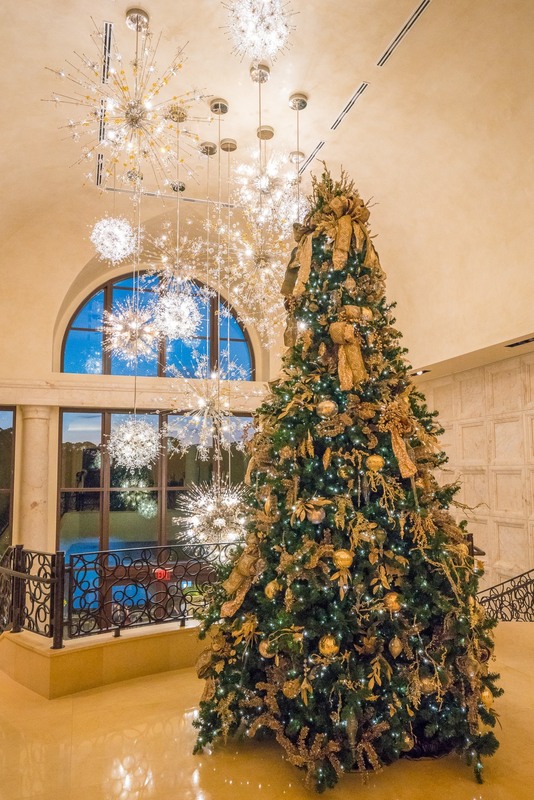 This hotel benefit is available through December 31, 2018, and is subject to change without notice. Guests without the Park Hopper Option or Park Hopper Plus Option must use their ticket for admission to the same theme park where they would like to enjoy the Extra Magic Hours benefit. Please be sure to check the Walt Disney World park calendar to see when Extra Magic Hour applies during your stay. Even though there is so much information readily available online, this service is an incredible asset. We had a ton of last-minute questions which the desk handled while providing even more insight. Lost luggage? No problem. 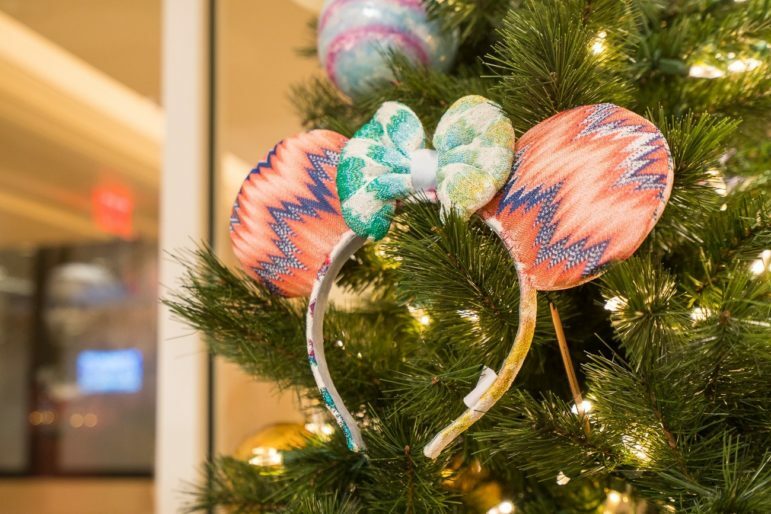 The boutiques onsite have everything you might need from swimsuits to Missoni ears (a special collaboration with Four Seasons Resort Orlando at Walt Disney World) to toiletries. 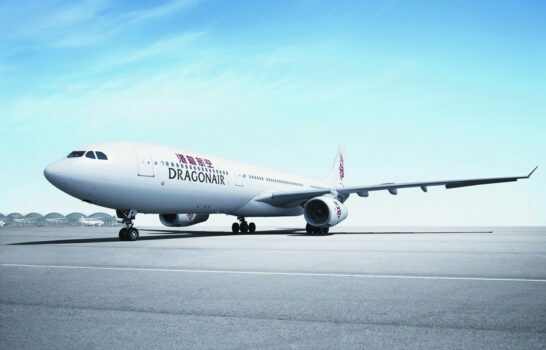 In fact, you may wish for lost luggage after browsing the racks. We picked up quite a few Christmas presents here, actually. Speaking of Christmas, their tree was absolutely stunning. We’ve been to Walt Disney World Resort before, in addition to theme parks all over the world. I can say without hesitation that this is by far the most relaxed we’ve been during a theme park holiday. After a brief trip to Crystal River to swim with manatees, the final part of our Orlando family vacation centered around Universal Studios, about 20 minutes away from Four Seasons Resort Orlando at Walt Disney World Resort. 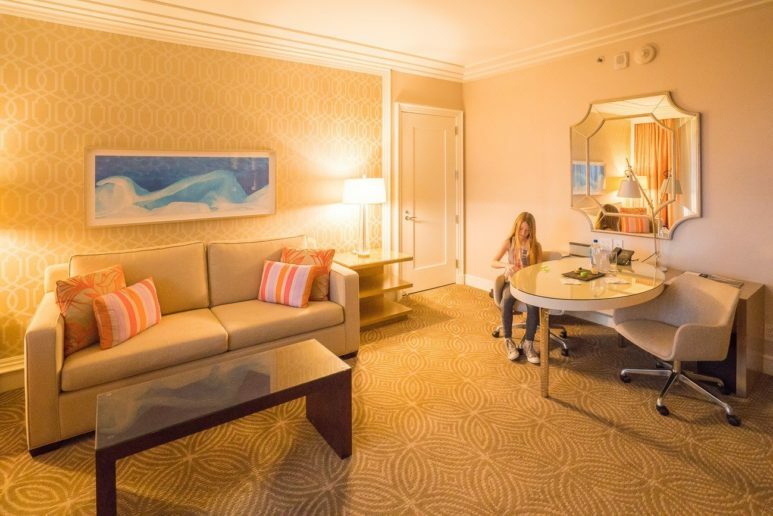 Long story short, next time, I will forego the early access to Universal Studios provided by their resort hotels (but arrive sufficiently before park opening) and stay at Four Seasons where we were noticeably happier and the vibe was less chaotic. I promise that you will not regret a stay here. It is one of the most well-thought-out Four Seasons properties that I’ve ever stayed in so I can’t recommend it highly enough. 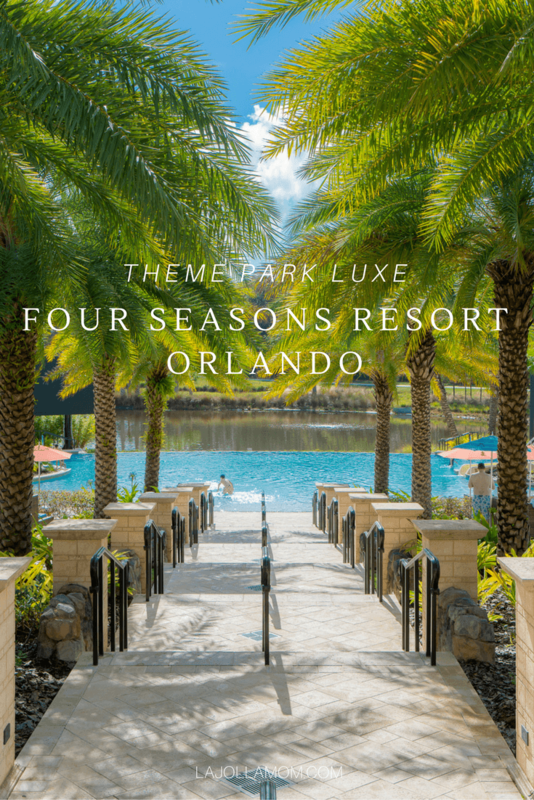 Have you stayed at Four Seasons Resort Orlando at Walt Disney World Resort? 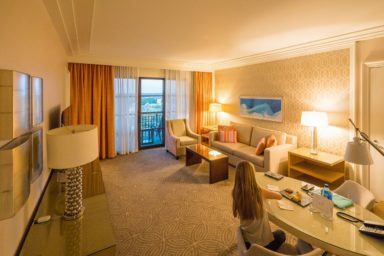 *Thank you to Four Seasons Resort Orlando at Walt Disney World Resort for providing us with a media room rate. This did not impact my review – at all. 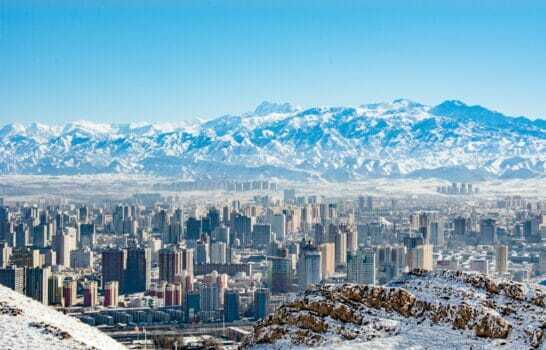 Why Would You Visit Ürümqi, China?